Chrome vanadium steel blade. Chrome plated blade with magnetic tip. Line color transparent handle. Chrome vanadium steel blade ensures greater hardness, strength, and durability. Satin chrome plated blade with magnetic tip. Soft cushion grip provides greater comfort and control. Thumb stop allows for added torque. Chrome vanadium steel blade ensures greater hardness, strength, and durability. Satin chrome plated blade with magnetic tip. Soft cushion grip provides greater comfort and control. Thumb stop allows for added torque. Standard, fluted blade is made of alloy steel for long life with hardened tips that are slip resistant. Ergonomically designed handle for comfortable grip. Standard, fluted blade is made of alloy steel for long life with hardened tips that are slip resistant. Ergonomically designed handle for comfortable grip. Fluted, standard blade and tip made of alloy steel nickel with hardened tips for slip-resistant fit. Ergonomically handle for comfortable grip. 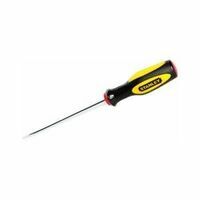 Four in one screwdriver with hi-torque fiberglass, reinforced nylon construction; electronically safe; UL tested at 2,000 volts; rare earth magnet retains both bits and screws. Includes (2) Phillips and (2) slotted standard power bits all retained in the handle; counter display carton. 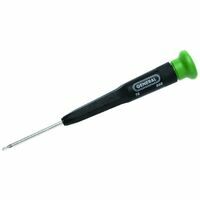 Ultra small 4-in-1 pocket screwdriver is the same size and shape as a pen complete with a pocket clip. 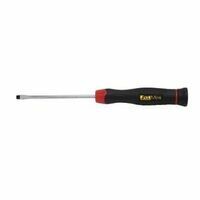 Capped for safety, this tool has 2 interchangeable chrome vanadium blade ends totaling 4 screwdrivers. Used by mechanics, technicians, hobbyists and do it yourselfers. Includes: 1/16", 1/8" Slotted tip and #1, #100 cross point tip. Shelf Pack in Display Box. Chrome vanadium steel blade ensures greater hardness, strength, and durability. Satin chrome plated blade with magnetic tip. Soft cushion grip provides greater comfort and control. Thumb stop allows for added torque. 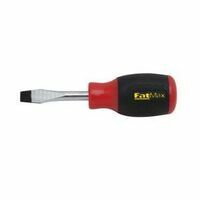 FatMax Screwdriver, Series: 62 Series, NO 0 Point, Phillips Stubby Point, 5-1/2 in Overall Length, 2-3/8 in Shank Length, 1/8 in Blade Diameter, Ergonomic Tri-Lobular Handle General Tools Cell Phone Screwdriver, 1-1/2 in Point, 4-5/8 in Overall Length, Steel Blade, Chrome Plated The convenience of a set of precision drivers in a one pocket tool. Non-slip textured surface has slip, crack and peel resistance. Magnetic bits attract and hold small screws. Soft and comfortable bi-material grip; Includes tip sizes: 5/32", 1/8", 1PT, 2PT. Chrome vanadium steel blade ensures greater hardness, strength, and durability. Satin chrome plated blade with magnetic tip. Soft cushion grip provides greater comfort and control. 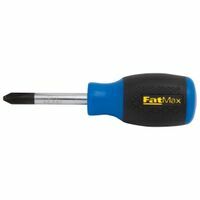 FatMax Screwdriver, Series: 62 Series, NO 2 Point, Phillips Stubby Point, 4 in Overall Length, 1-3/4 in Shank Length, 1/4 in Blade Diameter, Ergonomic Tri-Lobular Handle Provides 6 popular Phillips and slotted screwdrivers for a wide range of fastening applications. Swivel head handles provide precision and reach. Tough plastic shafts with soft cushion grips. 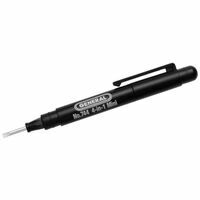 Includes: 0-point and 1-point Phillips, and 1.4-mm, 2.0-mm, 2.4-mm and 3.0-mm slotted screwdrivers and plastic storage case. Carded. 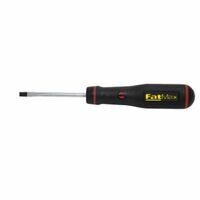 FatMax Screwdriver, Series: 62 Series, 1/4 in Point, Magnetic, Stubby Point, 4 in Overall Length, 1-3/4 in Shank Length, 1/4 in Blade Diameter, Comfort Grip Handle Chrome vanadium steel blade ensures greater hardness, strength, and durability. Satin chrome plated blade with magnetic tip. Soft cushion grip provides greater comfort and control. Thumb stop allows for added torque. Blade made of heat treated 8650 alloy steel (nickel-chromium-molybdenum) that is chrome plated to resist corrosion. Rotating cap; Facets fit palm, recess fits finger tip, driver tip size shown on cap and a 8-sided non-slip cushion grip. Color coded ring identifies type of tip. Carded.